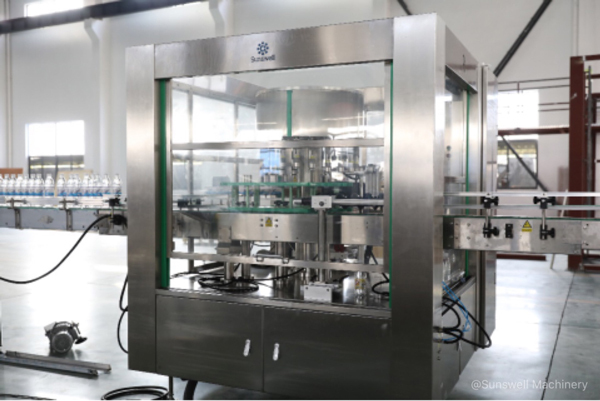 Sleeve labeling machine, ROPP labeling machine and self-adhesive Labeling machine, usually they are the most commonly used for attaching labels into bottles in beverage packaging lines. Recently we finished delivery of a 24,000bph ROPP labeling machine to our customers in Chiapas, Mexico. If the capacity is less than 10,000bph, most clients will choose PVC or PET material label which uses sleeve labeling machine. During production the machine uses hot steam to shrink the label, so steam generator is necessary. Advantage of the sleeve labeling machine is that the price is lower, but PVC label price higher, also the power consumption is more than 22kw/hr. If the capacity is more than 10,000bph, ROPP labeler will be a good choice. Though machine is expensive, but it is low power consumption and ROPP labels are much cheaper than PVC and self-adhesive labels. High quality beverages always uses self-adhesive labels. Self-adhesive labeling machine is the cheapest but the price of self-adhesive labels labels is the highest. Those labels make the finished product looks higher quality. Sunswell ROPP labeling machine is one of the best machines in packaging market, especially the high capacity bigger than 20,000bph. We offer the most reasonable and practical whole line solutions for beverage filling and packaging with more than 10 years’ experience.